"I have seen it. I am the prophet of his coming." Werner Herzog has always courted controversy with his visionary and highly personal films. Although of late he has primarily turned to documentary films, he has continued to be a controversial figure. This is exemplified by his fictionalized retelling of "a true story" centered on pre-Hitler Judaism in Poland and Germany, filled with characteristic ambiguity. Zishe Breitbart (Jouko Ahola) is the mighty son of a blacksmith in 1932 Poland. When he handily defeats a circus strongman, German theater promoter Landwehr (Gustav Peter Woehler) arranges for Zishe to go to Berlin as a performer. But after Zishe reluctantly arrives, the rise of the Nazis means that he must hide his Jewish heritage. Installed at the Palace of the Occult operated by Erik Hanussen (Tim Roth), this is a bit too close for comfort, since Hanussen openly courts the Nazi elite for his clientele, making predictions of Adolf Hitler's rise to power as the savior of the German people. Zische continues to perform in the blond-wigged guise of Siegfried, the Iron King of the Teutons, until his mother and idolizing younger brother Benjamin (Jacob Wein) come to visit him. Ashamed at his concealment, Zishe determines to reveal his Jewish background, come what may. Ahola is an interesting actor who makes Zishe a highly appealing lead; with his physique and jovial character, one might anticipate him becoming the next Arnold Schwarzenegger; he has oodles of charisma, even when not displaying his musculature. Tim Roth is aggressively slimy as the corrupt and sleazy mesmerist Hanussen. Anna Gourari appeals nicely as the club pianist, Marta Farra, who is abused roundly by Hanussen and fulfills the love interest for Zishe. The ubiquitous Udo Kier has an enjoyable, small role as Count Helldorf, the Berlin police chief. The obvious parallel between Zishe's story is that of Samson among the Philistines, with a tendency toward self-destruction in his attempt to bring down his enemies. Marta isn't exactly a Delilah, however, so one can't carry the metaphor too far, but the repeated references to Samson and Zishe's elevation to the status of hero of the Jewish people is unmistakable. Most intriguing is the segregation of the club after Zishe has revealed himself: Nazis sit on one side, disbelieving that a Jew could be so mighty, and the other side is full of Berlin Jews, eager for a savior in the guise of a strongman. Of course, no good can come from this arrangement, and the film doesn't disappoint. Herzog is uncompromising and unflinching in depicting the brutality of the Nazis, even before they came to power, as they intimidate, attack, and kill anyone who dares to speak a world view at odds with their own. Hanussen is reminiscent of Klaus Maria Brandauer's corrupted turn as a compliant actor under the Nazis in István Szabó's Mephisto (1981); the two films would make a compelling double feature. The picture builds to a powerful and moving finale through a series of turns that are mostly quite unexpected. By turns mystical, emotional and spiritual, the script briefly takes a surprising left turn into a courtroom drama before coming to the shattering last segment. The soundtrack by Hans Zimmer and Klaus Badelt is highly powerful and underlines the emotional drama and transformation of Zische. There are also supremely gorgeous moments, such as the soul-like floating jellyfish in tanks that surround Hanussen's occult inner sanctum. 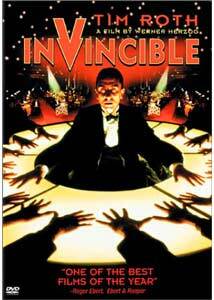 Herzog is still one of the finest living directors, and Invincible marks a terrific return to form. Image Transfer Review: The anamorphic widescreen picture looks quite good, as befits a recent film. No frame damage is visible. Colors are excellent and vivid throughout. While black levels are deep and rich, shadow details are readily visible. Textures pop off the screen. No edge enhancement was visible. Audio Transfer Review: A pair of 5.1 soundtracks are provided, in both DTS and DD. The quality of both is excellent, though the DTS is recorded at much higher levels. After correcting for this, I found very little to distinguish the two and either one will provide a very pleasing audio experience with clean, immersive sound and no hiss or noise. Beethoven's Third Piano Concerto makes several prominent appearances in the soundtrack, with startlingly lifelike presence. The music has plenty of bass although there is little else in the way of bass on the soundtrack to really justify an LFE track. There is also a 2.0 surround track that is quite lacking in oomph in comparison to the 5.1 tracks. Dialogue often is off from the lip movements, but since the film was shot in English this appears to simply be the result of sloppy ADR work. Extras Review: New Line presents precious little for extras here. There's an anamorphic widescreen trailer, as well as trailers for three other New Line films that seem to have zero connection with the feature. A DVD-ROM weblink (Windows only) connects one to the New Line site. Pretty disappointing for a film by a director of Herzog's stature, especially in comparison to Anchor Bay's often richly-supplemented Herzog discs. Werner Herzog turns his unflinching eye to the rise of the Nazis and a brief, frail hope for the Jews of Germany and Poland. The transfer is very good, although little is provided in the way of extras.